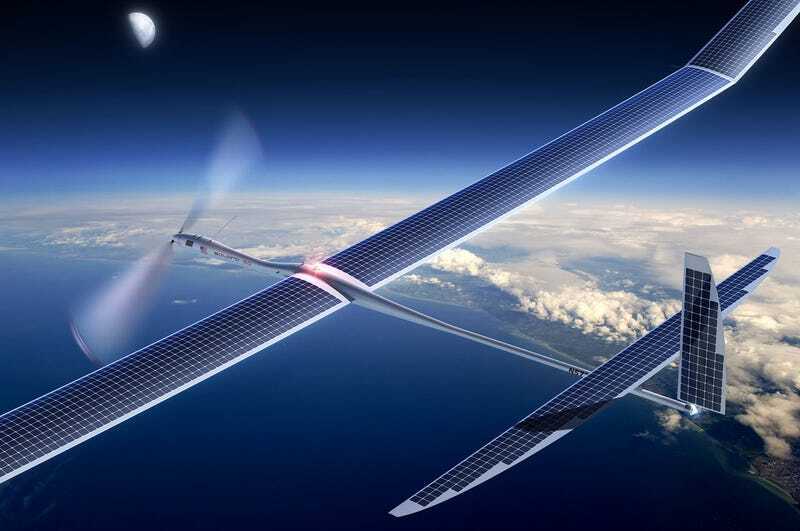 While everybody’s eyes were on Google I/O this week, another little bit of Google news nearly managed to slip under the radar: The tech giant’s high-flying, solar-powered Solara 50 drone apparently crashed landed in the sands east of Albuquerque weeks ago. Whoopsie. The drone, perhaps inspired by one of those giant dragonflies that ruled the ancient Earth, was only a prototype, but an important one. It was a model for a larger unmanned craft that Google envisions deploying to deliver Internet service in parts of the world that lack sufficient ground-based infrastructure. Titan Aerospace, which is building the Solara test drones, says the final version will have a wingspan of 164 feet and cruise high above both clouds and normal air traffic, beaming signals to Earth like a satellite. Its batteries are apparently designed to store enough electricity to keep the craft buzzing all night long and to stay aloft for up to 5 years. That is, if it can stay up for five minutes. The Solara 50’s untimely fall shortly after takeoff on May 1st is a setback for the tech giant, which, according to Bloomberg Business, is in a bit of a competition with Facebook to see who can beam us Internet from the sky first.